Christmas, New Year and long into January haven’t been especially festive times here at Tipple Towers. A nasty and persistent bug not only dented my enthusiasm for sampling and blogging but cauterised my palate to such an extent that anything I could taste more closely resembled a pint of creosote or furniture polish more than it did a fine beer or whisky. So how best to ease myself back in now that some kind of a recovery seems finally to be in effect? Well I’ll have to put my reviews of some long-aged special bottlings on hold, probably until next year end (Malheur Bière Brut, Duvel Triple Hop and Achel de 3 Wijzen were all lined up for consumption but gained another stay of execution). Instead I’ll pick up again on the off-sale scene for quality beverages I’ve previously explored through my visits to Beers Of Europe and SlowBeer, this time with a rare outlet devoted to cider and perry. That a dedicated cider shop should be found in Essex might seem odd. After all, the county is a long way from Britain’s “cider central” in the West Country, the West Midlands and into Wales. That said notable cider making traditions do persist in neighbouring counties such as Kent and Suffolk – albeit of a rather different kind to those of further west – and there are even some small local producers too. Some of these have been available in the shop but it’s to the spiritual homes of British cider and perry further west that much of the selection naturally looks. In my three visits to date I’ve picked up bottles from a wide selection of cider and perry makers and at very decent prices too (cider attracts the lowest alcohol taxes of any drink in the UK, apparently). These have included examples from Gwatkin, Sandford Orchards, Mr Whiteheads, Once Upon a Tree, Gwynt y Ddraig, Perry’s, Cornish Orchards, Olivers and others. Even some of the more interesting examples from cider “giant” (these things are relative) Thatchers. That said, I’ve also sampled Kentish specimens such as Biddenden and Double Vision, both very different experiences to their western cousins, being (I believe) made from blends of cooking and eating apples rather than classic cider apples and more closely resembling white wines than typical British ciders. 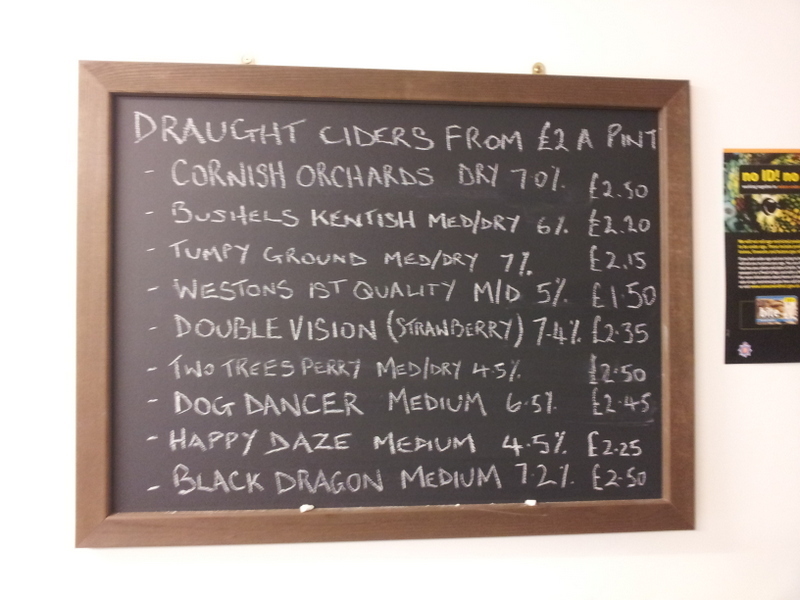 There’s also an impressive, regularly-changing lineup of around eight or so draught ciders and perrys to take away in jugs or carry kegs, which I haven’t yet dabbled with. You’ll also find apple brandies, meads, pressed juices, chutneys and other items, including great chilli sauces from The Chilli Company in Suffolk. 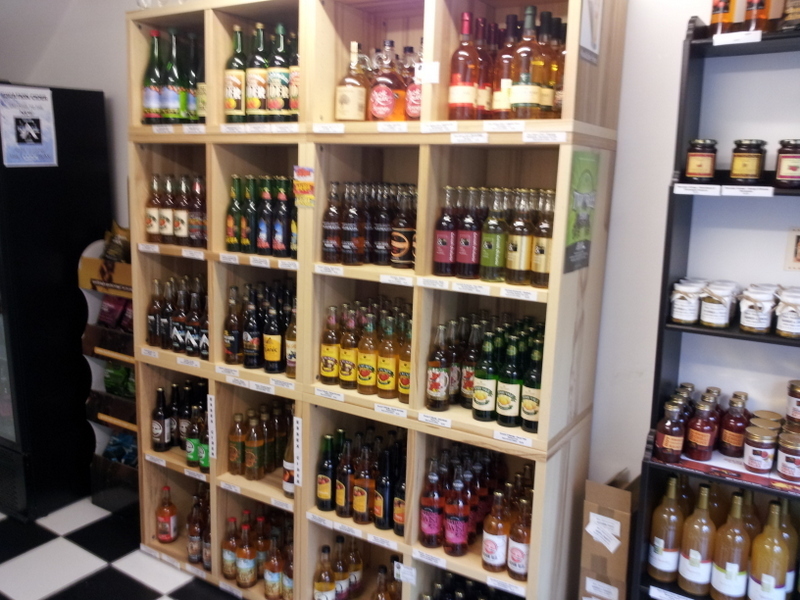 The Essex Cider Shop serves very nicely as a convenient outlet for interesting cider and perry in my local area and fills a gap not adequately occupied by the likes of Beers of Europe. It even goes some small way towards making up for the loss of Onlyfinebeer’s greatly-appreciated, if short-lived, beer-led emporium on the other side of town (although that business retains an online presence here). There’s a lot of variety to discover among British ciders and perrys. Indeed, I find myself having to resist my urge to veer towards the dry and cloudy ends of the flavour spectrum to try other expressions. My hope is that the The Essex Cider Shop and its dedicated proprietor Cliff Noakes is able to stand on its own feet and continue servicing both the curious (I count myself in this category as regards cider) and the enlightened for a long time to come. Do show your support if you’re in the area. The Essex Cider Shop is open for your patronage seven days a week between 10.00am and 7.00pm, except Sundays when hours are (rightly) curtailed to between 11.00am and 4.00pm.